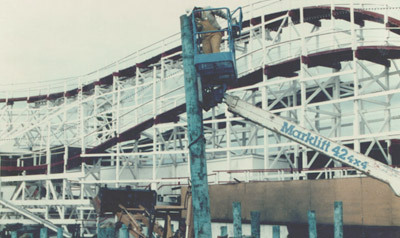 The Haunted Castle was entirely demolished and rebuilt between Labor Day 2009 and Memorial Day 2010 an expedited timetable that made use of the off season and required crews to work 24/7 for four months. The new basement, constructed below sea level in the sand, had to be completed before the height of the winter storm season could bring sea water to threaten the building. 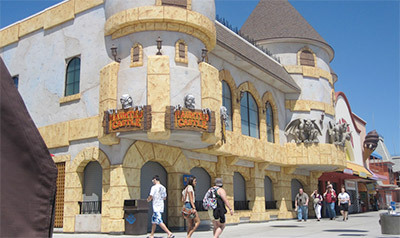 Home to the Haunted Castle ride, which was a custom design concurrently under construction in Italy, the basement had to meet specifications that evolved over time. The finished building also includes second floor office space, an ice cream parlor and two new game rooms. 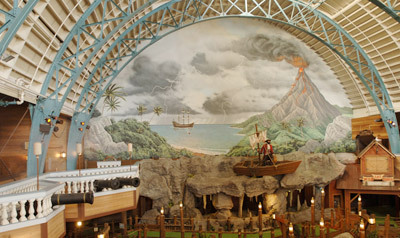 The Logger’s Revenge water ride suffered major damage in the 1989 Loma Prieta earthquake. The flume ride had shifted off of its support piers and the Olympic-sized pool that sits underground to re-circulate water had completely disintegrated. Slatter was hired to make the ride seismically safe, which required that the new piers be drilled down through 40′ of beach sand and seawater to bedrock, and to build a new subterranean holding pool and infrastructure. The Santa Cruz Beach & Boardwalk has posed tough construction issues, but none more challenging than building Neptune’s Kingdom, damaged in the 1989 Loma Prieta earthquake. The historic building still sat over the Plunge (a 408,000-gallon capacity swimming complex) built in 1907 that was filled in with sand in 1963. The job demanded a complex de-watering system, as the project was below sea level on one side and bounded on the other by an underground river. Slatter figured out how to hold up the roof of the building on steel legs so that the sub structure could be completely gutted. Slatter crews removed the Plunge and installed a new basement and three floors of attractions, including an 18-hole miniature golf course, arcade and restaurant. The 66,000 square foot renovation came in on time and within budget. 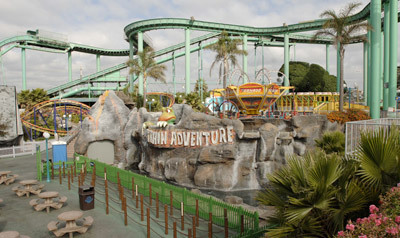 The foundation for the 125′ high steel structure of the Double Shot was installed in 2004, with the necessary plumbing, structural and mechanical structures to support the ride. 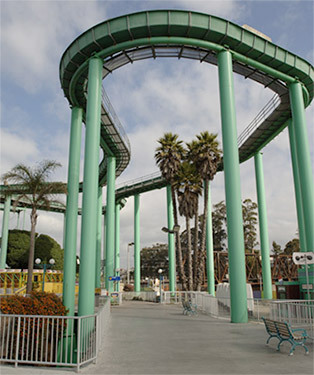 The Surf Bowl was remodeled and retrofitted in 2001, which involved knitting the two original buildings together and adding trusses and steel frames to the structure. The project also included gutting and renovating the 23 bowling lanes, snack bar and shop. In the summer of 2001 the Cave Train was entirely re-built and enlarged.